A 66-year-old man presented with progressive breathlessness for 1 week. Further history was consistent with orthopnoea and paroxysmal nocturnal dyspnoea. He was a known case of ischaemic heart disease, on medical management with poor compliance, for 5 years. On examination, blood pressure was 130/70 mm Hg, pulse rate 94 beats/min and respiratory rate 36 breaths/min with SpO2 92% at room air. He had raised jugular venous pressure (12 cm of water), bilateral pitting pedal oedema and bilateral basal crepitation on chest auscultation with gallop rhythm (LVS3). Echocardiography revealed systolic dysfunction with an ejection function of 30%–35%. 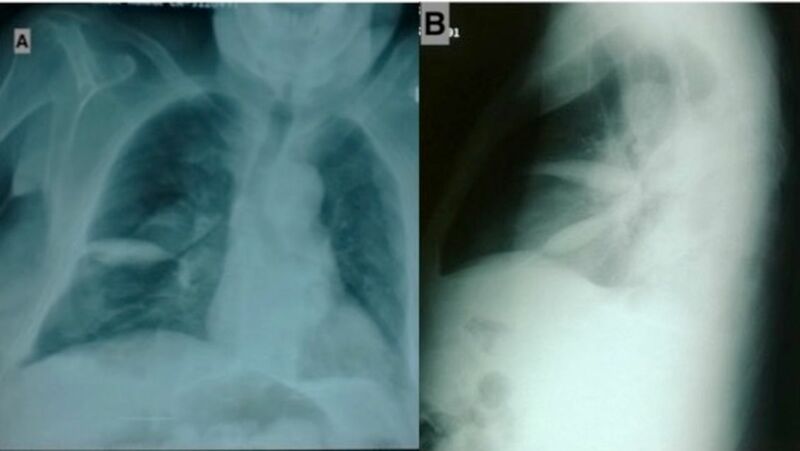 His chest X-ray (posteroanterior view) showed well-defined biconvex opacity on the right side of the lung (figure 1A), and lateral view showed well-defined lenticular opacities along the transverse and oblique fissure (figure 1B). He was diagnosed as congestive heart failure with phantom tumour. The patient was started on a diuretic (furosemide 20 mg two times a day) along with supportive care. The patient improved gradually, and opacification disappeared after 5 days of diuretics. Hence, confirming the diagnosis of phantom tumour. (A) Chest X-ray (posteroanterior view) showed well-defined biconvex opacity in right middle zone (phantom tumour). (B) Lateral view X-ray showed well-defined lenticular opacities along the transverse and oblique fissure (loculated pleural effusion). Phantom tumour (or vanishing tumour) is a loculated transudative pleural effusion in the pulmonary fissure in the patient with volume overload, most commonly seen in congestive heart failure.1 Other conditions include renal failure, cirrhosis and hypoalbuminaemia. Chest X-ray shows well-defined lenticular opacity along the lung fissure, which is better localised on lateral view.2 Retraction force produced by the increased elastic recoil of the lung in the presence of underlying atelectatic lung is the proposed mechanism considered responsible.3 Pleuritis causing adhesions and obliteration in the pleural space also plays a key role in the pathogenesis. Treatment is diuretics along with treatment of the underlying aetiology. Phantom tumour also known as vanishing tumour is a loculated pleural effusion seen in conditions associated with fluid overload. It if fully reversible with diuretics and correction of the underlying disease. Knowledge of this entity may avoid unnecessary investigation and cost. Contributors RS, AJ and KM wrote the manuscript. RS, AJ, KM and PM were involved in patient management and collection of data. RS, AJ, KM and PM read the manuscript and vetted for the final manuscript.